This will be the best trip we can recommend to you after Annapurna Adventure. Kathmandu, Bodhnath Stupa, Pashupatinath temple, Patan Durbar Square and the Patan Museum. Three days trekking starting from Sundari Jal and finishing in Nagarkot. Nagarkot in the northern and eastern fringe of Nepal is famous for its Himalayan views and observing these spectacular peaks at sunrise are a magnificent sight to behold. Many visitors wish upon their arrival that they would have planned for more than one day in this area. Nagarkot is surrounded by thickly forested hills of pine trees which give you an idyllic scene. It is a comfortable resort high on the northern fringe of the Kathmandu valley and offers outstanding views of Himalayas, breathtaking mountain scenery and the most impressive views of sunrise and sunset. Nagarkot is famous for providing one of the broadest views of the Himalayas in the Kathmandu valley (8 Himalayan ranges of Nepal out of 13 from here). The view gives you a cross section of these spectacular mountain ranges from Dhaulagiri in the west to Kanchenjunga in the east (8586 m). On a clear day, you can see Mt Everest (8848 m) you can also see Manaslu (8463 m), Ganesh Himal (7111m), Langtang (7246m), The Annapurna range, Manaslu range (8156 m), Ganesh Himal range(7406m), Jugal range, Rolwaling range, Dorje Lhakpa Himal (6966 m) also views of the Kathmandu valley and Shivapuri National Park. This will be the best trip I can recommend after the Annapurna adventure. Biking equipment and specialist guides. Be met by your Adventure Hub Nepal, (AHN) guide and transferred to your hotel. Relax and recover from jetlag and then have dinner in a local restaurant nearby the hotel in the Thamel area of Kathmandu. Stay overnight in hotel. Enjoy the day sightseeing around the Kathmandu valley and immerse yourself in the Nepalese culture. Visit Bodhanath Stupa, Pashupatinath, Patan Durbar Square and the Patan Museum. Between 4-6pm we will have a pre-departure meeting for the trip at your hotel. Get any last minute personalized items or gear for the trip. Stay overnight in Kathmandu. Get up early morning and have breakfast and board the bus and drive to Sundari Jal for approximately 1 hour. Trek to Chisapani for 4 to 5 hours passing through a few settlements on the way. The hike trail passes through lush forest to Chisapani the destination of the first day of our trek. Chisapani is a mixed settlement of Brahmins, Gurung and Sharpas. The village also commands a beautiful view of the large section of the Himalayan range, which emits an ethereal glow in the setting sunlight. Stay over night in lodge or hotel. Leaving Chisapani after our breakfast trek along the forest through Shivapuri National Park with only the occasional village and then we reach Nagarkot the most popular vantage point to the east of Kathmandu. In clear weather enjoy the views of an extended portion of the Himalayas, starting from Dhaulagiri in the west to Mt Everest and Kanchenjunga in the far east. If you wake up early in the morning to view the sunrise and will feel the full force of the charming glow the Himalayan range exudes, when the fresh rays of the rising sun strike them. Stay at lodge or hotel. After our lovely breakfast, we will start our trek where there is a small walking trail just below the club Himalayan and continue towards to Rhonnie Bhanjynag. We can experience a wonderful Himalayan view from the ridge of Rhonnie Bhanjynag. We continue futher through the rugged trail towards Dhulikhel and we will pass through the villages of Kankre and Tanchok and then reach Tusal. From Tusal we will climb uphill to the town of Opi where we will trek furthermore and reach the beautiful hill of Dhulikhel. Stay over night in lodge or hotel, or possibly camping, all depending on that specific day. This evening we will get our mountain bikes and meet our guide and get prepared for the next two days mountain biking. This morning, we will meet our professional Mountain Biking guides. Pick up our bikes and get fitted out for cycling. We will get up early to start preparing our bikes and equipment. After breakfast ride bike along the nice road through agricultural lands plus you will see the beautiful Sun Kosi River on your left as we ride for day. We will bike for a couple hours have a lunch break and then another hour or two bike after lunch. We will stay at Nepalthok and camp or home stay which will be decided prior to arrival. Most of the biking be downhill. It will be awesome! Mountain Biking from Nepalthok to Khurkote. We will ride mostly downhill on the road through villages and rolling hills. Cycling along the beautiful Sun Kosi River where we will see the thundering whitewater rapids. This will take 3 or 4 hours to our camp site at Khurkot. 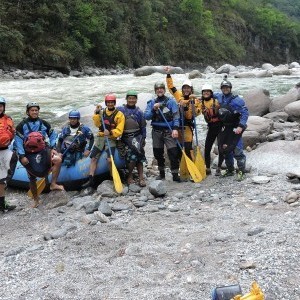 Here we will meet the Whitewater Rafting crew staff and get fitted out with equipment for Whitewater Rafting/Kayaking. We will cross to the other side of the river for spending the night camping on the riverbank. Whitewater Rafting/Kayaking Sun Kosi River continues. 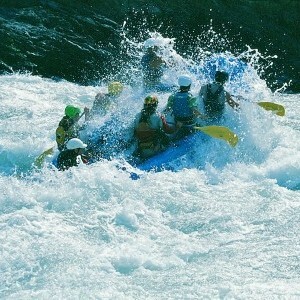 The Sun Kosi has been described as one of the best white water trips in the world. Big volume rapids, beautiful scenery, warm water and excellent beaches for camping. The river travels from the northern part of Nepal and travels all the way east to the terai, flat lands of Nepal. All the major rivers from the Himalayas drain into the Sun Kosi and the river increases giving a feeling of power. You will travel through lush jungle, rice paddies and pass small villages. Monkeys, deer and many species of birds inhabit the Sun Kosi river corridor. Class 2- 4+ rapids over 6 days paddling around 155 kms from the put in at Baseri Village just above Likhu khola and take out at Chatra. This river trip is truly a wonderful experience. Camping along the way on river beaches, which are perfect for early morning stretching or yoga sessions and relaxing after paddling. On the last day paddle down to the take out of the Sun Kosi river stopping along the way at the Bharah temple. We get to the take out at Chatra unload everything from our raft and gear boats and then load on to the bus. After that we will go for a traditional Nepalese dhal bhat lunch. Then you will driven to Biratnagar airport and fly back to Kathmandu. The flight time is approximately 35 minutes. Arrive in Kathmandu go to your hotel, have a shower and enjoy the civilization after some time away. Today It will be a very lazy morning with a nice sleep in. Enjoy some last-minute shopping. Stay overnight in Kathmandu. Have breakfast and transfer to airport, fly home. 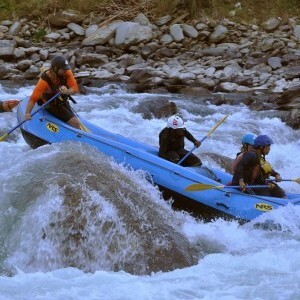 Adventure Hub Nepal has been operating adventure holidays trips since 2007. Today we can help you discover whole Nepal and we can offer high-quality, excellent –value, small group adventure to your interested area of Nepal, extend your holiday by booking some pre-or post tour accommodation- ask Adventure Hub Nepal. This itinerary is intended as a guide only. Local conditions and weather may necessitate variations to the program and can affect the availability of views and panoramas described. Be aware that all times stated are approximate and may vary with individual and group fitness, weather, Trekking routes, river level and road conditions. Although the culture of tipping may not be part or your own culture, it is nonetheless part of the culture in this area of world and it is often the way some people supplement their earnings. Tipping has also become an accepted part of tourism culture in the region. On our trips your trip leader can advise you on this matter, however as a guideline we would recommend a tip of 5-8%. If the service has been satisfactory, a tip is always appreciated with ……with a smile! To protect you from the sometimes seemingly endless soliciting of tips, we suggest you discuss with your trip leader about setting up a tipping kitty whereby everybody contributes an equal amount (this amount can vary from trip to trip, but a good approximate is US $6 per person per day) your trip leader can then distribute tips along the way to local guides, and porters, etc. This keeps a record of all money spent. Please note that this kitty is not designed to provide a tip for your trip leader. It is customary to tip your tour leader at the end of the trip, if you are happy with his/her service. A minimum tip of US $ 5 per day from each member of the group is the amount expected. *This itinerary is intended as a guide only. Local conditions and weather may necessitate variations to the program and can affect the availability of views and panoramas described. Be aware that all time stated are approximate and may vary with individual and group fitness, Weather , Trekking route , rivers level and road conditions.